Bobcat Australia announces the release of the new Bobcat 1539 mm Soil Conditioner and the 2126 mm Soil Conditioner designed for Bobcat Loaders. 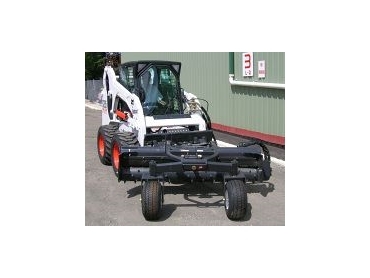 The new Bobcat attachments are great tools for saving time and labour on landscaping jobs. The hydraulically driven drum rotates both directions for maximum versatility. The drum, with weld-on carbide teeth, tears out old grass and pulverises clods. Grades and levels topsoil. The 1539 mm Soil Conditioner adjusts manually from a straight position to a 25-degree left or right angle creating windrows and separates rocks and other debris. The 2126 mm models have a hydraulic-angle feature, allowing the operator to adjust the drum angle (up to 25 degrees left or right) via fingertip controls from the steering lever handles. The 1539 mm, and the 2126 mm in manual-angle models, have three pre-set angles: straight and 25 degrees left or right. Soil conditioners feature a direct-drive motor, an oscillating front bolster, and an aggressive tooth profile with a shell on the drum for fast and easy replacement. The Bobcat 1539 mm Soil Conditioner is approved for the Bobcat 463 and the 553 Loaders. The 2126 mm soil conditioners are approved for use on the new Toolcat work machine, as well as models 753, 763, S175, S185, 863, S250, S300, A300, T140, T190 and T300 Bobcat loaders.